The standard chunk of used since the 1500s is reproduced below for those interested. Sections 1.10.32 and 1.10.33 from “de Finibus Bonorum et Malorum” by Cicero are also reproduced in their exact original form, accompanied by English versions from the 1914 translation by H. Rackham. Primarily with mid and high rise buildings and/or heavy demolition in mind, these chutes are made of .125” thick steel and are built to withstand just about ANY kind of debris. The patented baffle system breaks apart the debris on its way down, to maximize space in the dumpster below. And the extra large, 3’ x 3’, size ensures large debris can be efficiently and effectively disposed. The lockable doors add additional jobsite security and the unique screw jack mounting system holds the system away from the façade of the building. 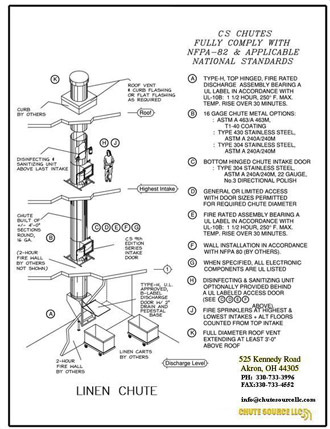 CHUTES’ steel chutes are the only debris chutes approved for historical buildings. In classical literature, discovered the undoubtable source. Chute Source LLC, trash chutes are constructed of #16 gauge aluminized steel, galvanneal and several different grades of stainless steel. Options for thicker gauge steel are also available. All of our equipment carries a one (1) year warranty and is built to NFPA 82 guide lines.“B” label with fusible link. The hopper also has a reinforced bottom with #13 gauge impact plate and is supported with a 2″ pipe pedestal and equipped with 2″ IPS drain flange for connection by plumber. Chute Source LLC, standard trash chutes are 24” in diameter but can be customized to 18”, 20”, 28”, 30” and 36” options. Sound dampening coating can be applied to outside of chute to minimize noise emitted by the chute. The floor frames of the chute are typically equipped with sound isolator pads at each floor connection point to isolate the chute from the floor of the structure. ½” IPS 155 or 165 degree sprinkler head with shield will be installed above the top intake, and additional sprinklers and shields will be installed at every other intake, as indicated by local fire codes. Optional: Each chute can include a Disinfecting and Sanitizing (D&S) unit with a manually-adjusting valve to regulate amount of disinfectant applied to the interior of the chute. Optional: For organic waste chutes, Chute Janitor can be added to provide enhanced washdown capability. Chute Source LLC, linen chutes are constructed of #16 gauge aluminized steel, galvanneal and several different grades of stainless steel. Options for thicker gauge steel are also available. All of our equipment carries a one (1) year warranty. Linen chutes are made to accommodate even the busiest hospital or hotel. The intake doors have also been specially designed to prevent broken closures. All Chute Source LLC Linen chutes are 24” in diameter but can be customized to 18”, 20”, 28”, 30” & 36” options. The standard linen chute intake door is 21” x 21” side-hinged hand operated with a 180 degree opening. All doors are self-closing and have a clear opening for bagged or bundled linens. A 24” diameter vent will be installed 4 feet above roof with a metal explosion cap. Floor frames will be fabricated using 1 ½”x1 ½”x 3/16” angle steel. The standard linen chute discharges into a recommended hopper with a 24? x 30?, top hinged, counterbalanced stainless steel door bearing 1-1/2 Hr. 250° F U.L. D&S unit helps keep chute cleans and free of odors. The system consists of a one (1) US gallon industrial cleaner reservoir, ejector valve, and spray head installed at the top of the building. Recommended usage is 5 minutes per 20 floors of chute at least once per week. For chutes under 20 floors, it is recommended usage is 1.5 minutes per floor per week. Access Door Assemblies: Manufacturer’s standard 15”x15”, side-hinged, ASTM A 240/A 240M, Type 302/304 stainless-steel doors; as required to provide fire-protection and temperature-rise ratings indicated; with frame suitable for the enclosing chase construction; and in No. 3 directional polish finish. Use in conjunction with Disinfecting and Sanitizing Unit above last intake or when long, otherwise inaccessible chute sections span several floors. Primarily with mid and high rise buildings and/or heavy demolition in mind, these chutes are made of .125” thick steel and are built to withstand just about ANY kind of debris. The patented baffle system breaks apart the debris on its way down, to maximize space in the dumpster below. The purpose of an electrical interlock system is to prevent multiple doors from opening at the same time. As well in the event of a fire all the doors will be mechanically locked by the Heat Detector above the last intake or at the discharge level by an installed Smoke detector. The main power supply can be switched off during the removal of the compactor container or dumpster which prevents personal injury to the maintenance people at the building. All the doors are controlled by the power supply which carries a UL Label 508A certification which covers the entire EI locking system as a separate UL certification. Our electrical inter locks are all low voltage class 2 wiring. 2 hand operation as a standard (hold in button until you open the door. Options compactor controlled power supply is also available. Optional single had operation is available so as to meet ADA requirements. It is important to note that UL Listed Class 2 Power Sources, whether Transformers or Power Supplies, are limited to an output size of 100VA. With the use of the desired 24 volt circuit, the maximum permitted amperage is 4.166 amps. Depending upon the amperage draw of our equipment, the maximum application of this system would be approximately 60 intake doors and a maximum of 600 ft of vertical height. Bottom Hinged, ADA-ABA, UFAS, and ICC/ANSI 117.1 Compliant or Side hinged, Fully Pneumatic or electromechanical, Limited Access Linen Chute Frame and Fire Door Assembly specified embossed trim; 180° door swing for side hinge or 55° for bottom hinge doors; Redundant opening; Self-closing with default door-closed position in the event of closer failure; Self-latching with default, full latch extension in permanent door-closed position during an active fire scenario; Frame anchors at top, bottom, left and right for installation in accordance with UL Certification for compatibility with either drywall or masonry enclosure construction. Sound Dampening: Manufacturer’s standard exterior mastic coating on chute: Daubert #932. Sound and vibration isolation pads to be provided for floor support frames. Custom Sound Dampening: Manufacturer’s custom, certifiable sound dampening coating: Daubert #3680. Sound and vibration isolation pads to be provided for floor support frames. Fabricate vent unit to extend 48 inches above roof (measured at the centerline of the chute) at full-diameter. Provide vent and metal safety explosion-release cap. Fabricate with roof-deck flange, counterflashing, and clamping ring of nonferrous metal compatible with chute metal. 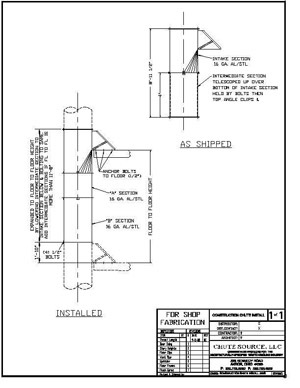 This section is modified by the selection below, if indicated: Provide Roof Vent with curb flashing with 4” turn down and drip edge at each side. Roof curb and waterproof tie-in to roof system by others. Provide Manufacturer’s UL Labeled, wall-mounted atomization unit with manual and automatic control of odor elimination fluid for both duration and frequency of spray. Indicate location of sprayer on wall. Provide painted steel cabinet for spray unit and 5-gallon container for fluid. The odor control system is a carefully designed and integrated system of atomization equipment and an odor elimination formulation. Substitution of an odor elimination product of any description other than the manufacturer’s non-pathogenic, non-opportunistic, safety control tested, non-perfumed, naturally occurring organic, bio-technically systematized, odor control formulation is strictly prohibited. Learn more about our channel sales program today and start earning revenue!